Have you ever taken a moment to think about how your vehicle's tires are made? Probably not, yet doing so may help you better understand what goes into our tire repair service. More than just a few inches of thick rubber, your tires are actually made from layer after layer of fabric cords called plies. These plies sit atop steel belts that help to reinforce both the sidewall and the treads, which is formed from several layers of synthetic rubber. Steel cable loops called beads give the tire the strength needed to stay seated on the rim. Once those components are placed together, they are run through a curing machine which cuts the tread pattern and bonds all the components together. To learn more about tires, including tire repair cost, visit Meineke #2304 in Jamestown, NC today. Tires are one of the most essential parts of your vehicle. They act as the only point of contact between your vehicle and the roadway, so they are vital for proper safety. They can also significantly impact how well your vehicle performs. If you fail to take your vehicle in for a scheduled tire change service, you could be increasing the wear on your vehicle and lessening the lifetime of connected components. You may also be putting yourself, your vehicle's occupants and others on the roadway in danger. As tread wears down on a tire, it does not maintain as much traction, which could cause your car or truck to lose control on the road. Stop by Meineke #2304 in Jamestown, NC to learn about a tire rotation service to prolong the life of your tires. How Can You Tell When Your Tires Need to Be Serviced? What are some signs that you need your tires or wheels repaired? Some may seem fairly obvious. A puncture or blowout will typically have you on the computer or phone researching all of your "flat tire repair near me" options. However, there are other, less subtle signs that your wheels or tires are in need of service. One may be if you experience issues with your vehicle's performance, such as a noticeable shaking in the steering wheel or the entire vehicle whenever you go above 40 mph. Another may be uneven wear across the tread of each of your vehicle's tires. 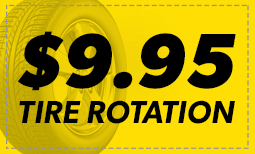 A quick balance or tire rotation service done at Meineke #2304 in Jamestown, NC can help you avoid ending up getting stranded on the side of the road. A flat tire leaves you stranded, pure and simple. Yet there are other reasons why you should ask yourself "Is there a good option for tire repair near me?" long before you ever get a flat. Avoiding routine tire rotations won't necessarily keep your vehicle from driving (up until excessive wear causes a flat, that is), yet it does limit their performance lifetime. Given the significant financial investment your tires represent, wouldn't you want to get the most out of them? 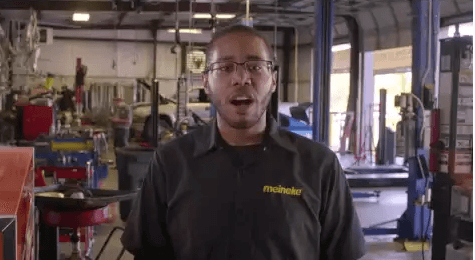 Contact us at Meineke #2304 in Jamestown, NC to learn how a low tire rotation can save you hundreds of dollars in the long run. Your tires will typically give you plenty of notice that you should look into tire replacement or repair. Low tire tread is a serious problem that can only be solved through replacing the affected tire and its twin. Cracking, noticeable wear on only one side of the tire and vibration coming through the steering wheel are all indicators that you should have your tires inspected by a professional. If you do not replace your tires promptly, they could pop while you are driving. Taking your car to Meineke #2304 in Jamestown, NC for a full tire inspection and tire repair is the best option for safe driving. If you're in need of new tires, you probably have concerns about the actual cost of tire replacement. While worn tires increase your risk of performance and stability issues on the road, that doesn't make affording new tires any easier. Fortunately, we at Meineke in Jamestown, NC can. Once you have your new tires, be sure to make frequent visit to our Meineke #2304 web page. We frequently post repair and tire rotation coupons there. This is our way of rewarding the trust you place in us.